Long Island Security Consultants Inc.
Long Island Security Consultants Inc. is a subsidiary of Long Island K-9 Service Inc., and was founded by Officer James Greco, a 19-year veteran of law enforcement. L.I.S.C. 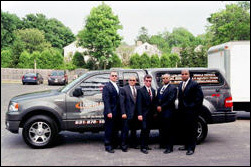 is licensed, insured, bonded, and provides various types of security services 24 hours a day, 365 days a year. L.I.S.C. prides itself in the ability to provide cutting edge technology to ensure each client the highest degree of private security available today. The staff of L.I.S.C. is comprised of veteran trained law enforcement or military officers who are either currently active in law enforcement or who have recently retired and remain active in private security enforcement. Many officers have at least 20 years of security experience and, as part of their training, are adept in; interpersonal communication skills, fire safety, crowd control, firearm retention and first aid. Whatever you requirements are, our staff is trained and equipped to provide you with optimum security measures.